Rüsselsheim. At 10:28 a.m. this morning Nici Walde got out of her velomobile at the Opel Test Center Rodgau-Dudenhofen – exhausted but overjoyed. Within 24 hours, she rode exactly 1,088 kilometres in her recumbent bicycle with full fairing and set a new women’s HPV world record (Human Powered Vehicles e.V.). No other woman has ever covered a greater distance powered solely by her own physical strength in this time span. Nici already beat the previous women’s record of 1,012 kilometres in just under 22 hours. 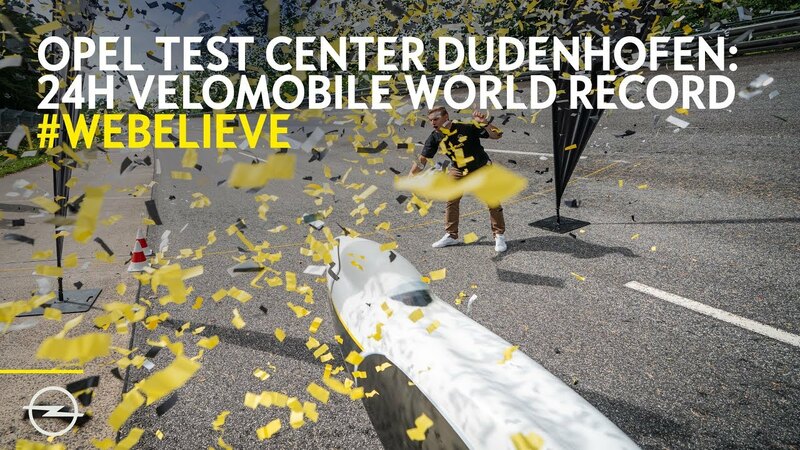 With this record, the extreme athlete makes history, just like the Opel Test Center. “What Nici Walde did yesterday and today is more than extraordinary. This achievement is unique,” said Johan Willems, Vice President Communications at Opel, full of praise. "We at Opel have done our best to support this ambitious and exceptional athlete. What's more, we were quite sure that she would be successful! We cheered Nici on around the clock. This is also made very clear by our motto #WeBelieve." Not only her team, but also numerous Opel employees and fans supported Nici Walde on site during her extreme ride. The most successful bobsleigh pilot at the Winter Olympics, André Lange and two-time Olympic quadruple scull champion, rower Karl Schulze, both kept their fingers crossed for Nici Walde. Opel brand ambassador and winner of the 24-hour races at Le Mans and the Nürburgring Joachim “Jockel” Winkelhock was also on site. Because they all know what it means to dare to attempt the almost impossible while always believing in yourself. After weeks of planning and countless rounds of preparation on the road and at the Opel Test Center, the "New 24-hour HPV World Record" endeavour entered the decisive phase on Friday. At the press conference, Nici Walde and the Opel representatives presented the meticulous preparations that were necessary on all sides to turn the record attempt into a new world record. On Saturday morning the time had come: tension at the Opel Test Center was palpable before the starting signal. André Lange waved the flag at 10:28 a.m. – and Nici Walde took off with her 257-centimetre long, 64-centimetre wide and 88-centimetre high velomobile. The recumbent bicycle with full fairing weighs just 14 kilogrammes and was developed by her partner Daniel Fenn, who was of course also at the track. The 44-year-old athlete covered lap after lap on the 4.8-kilometre long high-speed track in weather conditions with temperatures that sometimes topped 30 degrees Celsius during midday and afternoon hours and included intermittent torrential rain. But it became particularly strenuous for Nici Walde as the sun set and the ride through the night began. Because staying awake and constantly maintaining total concentration is even more difficult in these hours. The loud cheering during the last laps on Sunday morning motivated Nici to give it everything she had. When rower Karl Schulze finally waved the flag at the finish line, Nici Walde had covered a total of 1,088 kilometres in 24 hours and surpassed the previous record for women by 76 kilometres. The sometimes adverse weather conditions kept the men’s record of 1,219 kilometres out of reach. Overall, the extreme athlete completed 227 laps on the high-speed track at the Opel Test Center, reaching top speeds of up to 56 km/h with her own physical strength – a top performance! With this outstanding result, Nici Walde is now officially not only in possession of the 12-hour but also the 24-hour HPV world record. And the Opel high-speed circuit in Rodgau-Dudenhofen is once again a world record track after numerous records in the past set both with and without engines.